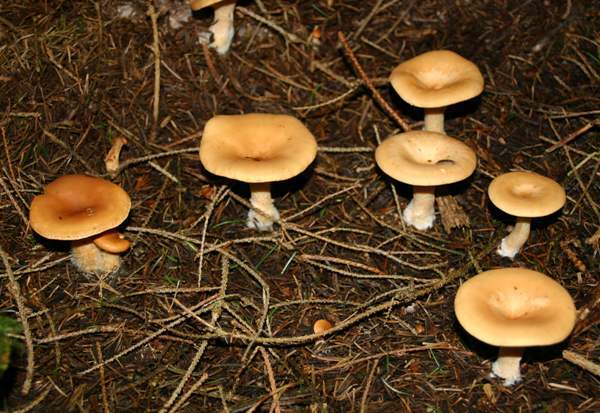 Clitocybe gibba grows in leaf litter in deciduous woodland and rough grass or heaths. 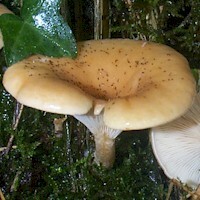 The dark cream or pale brown cap can be 10cm diameter at maturity. Like most of the fungi in this genus, it is a gregarious mushroom and often forms large arcs or even complete fairy rings. Very common throughout Britain and Ireland, the Common Funnel also occurs in most parts of mainland Europe and in North America. The Common Funnel was described in 1801 by Christiaan Hendrick Persoon, who named it Agaricus gibbus. Its currently accepted (although not by all authorities - see below) scientific name was established by Paul Kummer in 1871. Synonyms of Clitocybe gibba include Agaricus gibbus Pers., Agaricus gibbus var. membranaceus Fr., Agaricus infundibuliformis Schaeff., Clitocybe infundibuliformis (Schaeff.) Fr., Clitocybe infundibuliformis var. 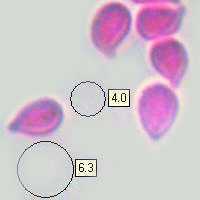 membranacea (Fr.) Massee, and Omphalia gibba (Pers.) Gray. 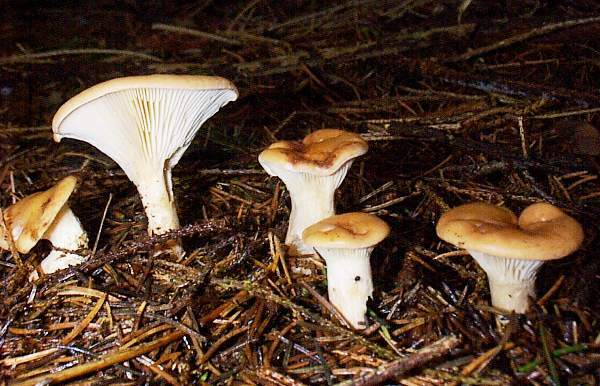 Results of DNA studies in 2003 prompted mycologists to set up a new genus Infundibulicybe with Infundibulicybe geotropa (synonym Clitocybe geotropa) as the type species. 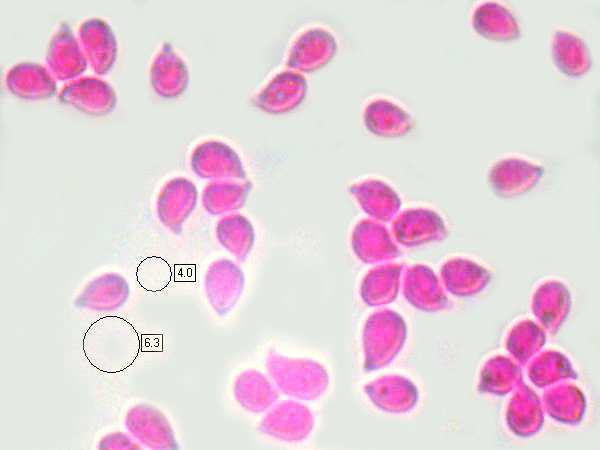 Into this genus the Common Funnel and its close relatives have been transferred, and in North America in particular the Common Funnel is more commonly recognised as Infundibulicybe gibba (Pers.) Harmaja. Common Funnels often form large arcs and sometimes complete fairy rings. The picture above, taken in mixed woodland in West Wales, UK, shows part of a fairy ring that was almost ten metres in diameter. The generic name Clitocybe means 'sloping head', while the specific epithet gibba means humped or rounded. 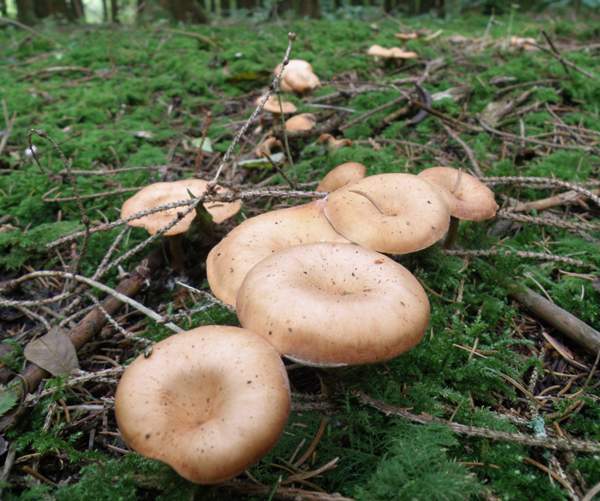 4 to 8cm in diameter when fully mature, the caps are smooth and silky, usually with a wavy edge, and creamy-brown, sometimes with a pinkish tinge. Initially convex, the caps expand and develop into funnels. The thick, soft flesh is light buff. 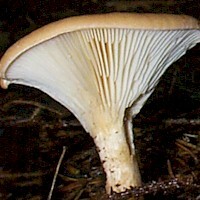 This funnel cap has deeply decurrent, white or pale buff gills that are narrow and quite crowded. 5 to 10mm in diameter and 3 to 7cm tall, the buff stems are tough, often hollow, and only slightly bulbous at the base. There is no stem ring. Ellipsoidal to pip-shaped, smooth, 5.5-8 x 3.5-5μm. Very faint odour of almonds (some say of new-mown hay); no distinctive taste. Saprobic, in leaf litter under hedgerows, in broad-leaf woods and on heaths. Lepista flaccida, commonly known as the Tawny Funnel Cap, has a larger red-brown cap and pale gills that become tawny with age; its spores are creamy-white, smaller and rounder than those of Clitocybe gibba, and finely warty. Clitocybe gibba is generally considered to be an acceptable edible mushroom, although not in the top rank. When young and fresh it can be used either fried with onions or in risottos, soups and many other mushroom dishes. The stems of Clitocybe mushrooms are rather tough and so many people discard them and eat just the caps. Courtecuisse. R. & Duhem. B., Mushrooms and Toadstools of Britain & Europe (1995), p.173. Bon, M., The Mushrooms and Toadstools of Britain and North-western Europe (1987), p.135.